For those who don’t know, my heritage is Russian and I have an affinity for Russian food because I grew up with it and enjoy eating it from time to time. 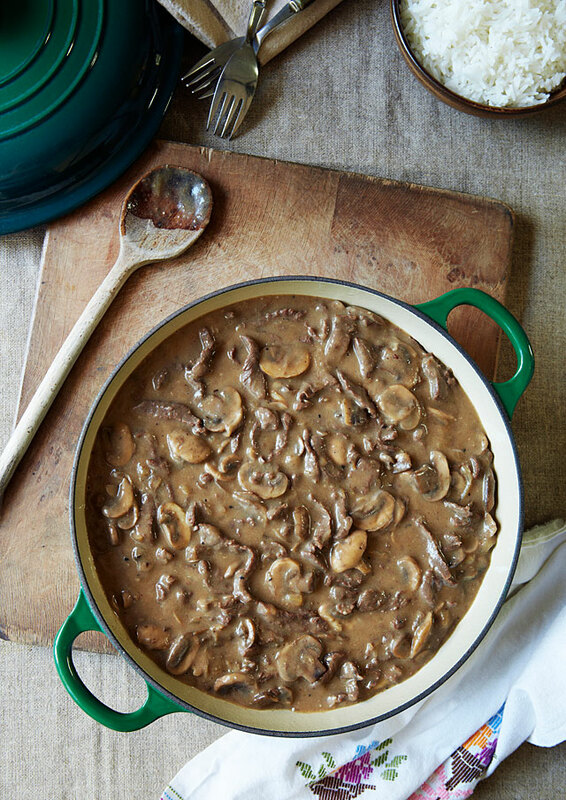 One of the dishes I enjoy the most is Beef Stroganoff and when I started researching it’s history, I naively thought that there was only one authentic version, my mother’s. I was wrong. I then read one of the original known recipes by Russian cookbook author Elena Molokovhets in her 1861 book A Gift For Young Housewives. She made hers with sour cream whereas my mother only uses pure cream (slivki in Russian) because she says it makes for a more flavoursome strog. It in fact turns out there are hundreds of different versions from ones made with sausage in Finland to versions made with buffalo meat in the USA. It is obviously a far more international dish than the strictly Russian one I thought it to be. But for this post I will focus on the one I love, the recipe I grew up with and that I still believe to be the best. I travelled to Russia in 2006. In my usual fashion of eating my way around foreign countries, I ate Beef Stroganoff wherever I could find it. I ate it at small family restaurants in rural country areas and I ate it at the exclusive and über pricey Café Pushkin in Moscow and I’m sorry to say I was somewhat disappointed. Perhaps it’s a case of what one grows up with being the benchmark, but the versions I ate just didn’t taste as good. My mother’s Stroganoff is literally melt in the mouth. It is made up of delicately sliced rump steak sitting in an incredibly flavoursome sauce with just the right amount of mushrooms and cream. She says the secret is in cooking the mushrooms separately in butter and adding them at the very end, just before you serve. It is an interesting fact that the name of the dish is said to have originated in the kitchens of the Stroganov family around the mid 18th century. The upper classes of Pre-Revolutionary Russia loved the French and considered everything Le Francaise to be the epitome of class and style. 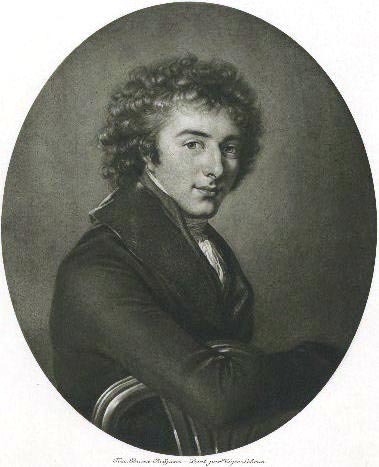 Russian cooks and chefs of the time were encouraged to cook in a French manner and many of them were shipped off to France to study cookery by their employers. Such an employer would have been Alexander Stroganov (see pic below) and if you ask me he looks a bit of a scamp. I reckon he would have enjoyed downing vodka shots with Beluga caviar whilst hanging out with his mates in the courts of old Russian aristocracy. He would have loved my mum’s strog, and I hope you do too. Prep time: 20 mins, cooking time: 60 mins. Serves 4-6 as a main meal. 1. Heat the butter over medium heat in a heavy base pan (I used a Le Creuset 24cm cast iron casserole pan) and fry your mushrooms until cooked through, they should have a dark brown appearance and some lovely juices in the bottom (approximately 5-7 mins). Put aside. 2. Using the same pan heat the olive oil on medium heat and brown your meat. Add onions and cook with meat until soft and translucent and keep cooking until there is quite a bit of moisture in the pan from the meat juices. 3. Add two of the tablespoons of soy sauce and stir to mix through. Do not add the third tablespoon until you have tasted the sauce towards the end of cooking. 4. Add chicken or beef stock (or water) if the meat and onions are dry but I find there is usually plenty of moisture in the pan at this stage. Simmer for at least 40 minutes on low heat until meat is soft, about 45 minutes is usually adequate but you may need a little more if your cut of beef is a little tough. 5: When the meat is cooked through add the cream and plenty of black pepper. If sauce is too pale, add a little bit more soy sauce to darken and if you feel the sauce needs a little more flavour. Bear in mind the sauce will darken a little from the mushrooms upon standing after Step 6. 6: At the end of cooking your meat and onions add the mushrooms, stir and simmer for another couple of minutes. Thicken if required (see notes below) and serve immediately. *If the sauce is a little runny, you can thicken with either a heaped teaspoon of corn flour or tapioca starch dissolved in about a third of a cup of water then add slowly to the pan whilst heat is still on stirring thoroughly. Be careful not to over thicken. Serve with steamed white rice or mashed potato. Also goes well with large flat pasta noodles though in my family it was pretty much always rice or mash, or on toast for breakfast (we weren’t much of a corn-flakes family). The flavours actually get better upon standing. Variation: you can also use veal. Well I couldn’t decide between a rustic tabletop setting or a simple setting for two so I did both. The one thing I had decided on was that I wanted to use predominantly vintage props. Both settings with the exception of the beautiful green Le Creuset pan and the wonky wooden spoon are made up entirely of bits and bobs from charity shops (thanks again Vinnie’s). The wooden spoon has been in my family for decades so it’s a veritable heirloom! Most of the Stroganoff dishes made in the States call for sour cream; I hate sour cream. So, I am so so so happy to know that the traditional version calls for thickened cream (which is like heavy cream?????). It sounds like it isn’t sour cream…now to find the equivalent here in Italy and in the States. I love that overhead shot of the big pot of Beef Stroganoff. It’s so inviting. This sounds like a fabulous recipe! Instead of thickened cream, can we substitute for sour cream, or should sour cream be added at the end if we like (I have a great love for sour cream!)? Thank you! Tanya, interestingly, stroganoff hardly ever contains mushrooms here in Estonia (and I would have thought that the version popular here is pretty similar to the Russian one). I only realised that it’s common to include mushrooms when living in the UK and coming across all those recipes calling for thinly sliced mushrooms in stroganoff. So you’re saying that your mum made it with mushrooms as well? Would love to know that. PS First time here, lovely photos! Two hours before serving, cut a tender piece of raw beef into small cubes and sprinkle with salt and some allspice. Before dinner, mix together 1⁄16 lb (polos’mushka) butter and 1 spoon flour, fry lightly, and dilute with 2 glasses bouillon, 1 teaspoon of prepared Sareptskaja mustard, and a little pepper. Mix, bring to a boil, and strain. Add 2 tablespoons very fresh sour cream before serving. Then fry the beef in butter, add it to the sauce, bring once to a boil, and serve. Recipe translation from Joyce Toomre, ed., Classic Russian Cooking: Elena Molokhovets’ A Gift to Young Housewives (Bloomington: University of Indiana Press, 1998), 213–14. So nice to see that you replied – and interesting, that your mother indeed used the mushrooms. Intrigued!!! I do make stroganoff quite often (see here: http://www.flickr.com/search/?w=92846239@N00&q=stroganoff ) – and some of my recipes include mushrooms as well. Summer version with chantarelle mushrooms was especially lovely. I just had to let you know that I have just made your Beef Stroganoff and it can only be described as A-grade! I was hunting for a good recipe and after reading dozens decided to try yours – at first I was afraid of its simplicity (all the others I read called for different spices, tomato paste etc. ), but it is an absolute winner! Thank you so much for sharing it. Hi, just had to say how much I and my family enjoyed your Stroganoff recipe. I’ve made different styles of stroganoff from different recipes, even added white wine in my earlier ones as I was told that was the way! Your recipe is by far the best, takes a little longer than the way I’ve made it in the past but so worth the effort. I like to add a lot of mushrooms as well! Thank you and please thank your mum for sharing your family recipe. It has become the recipe my family uses. I love your recipe… I am not a big fan of cooking with soy sauce unless I want something that tastes particularly of soy sauce. The whole purpose of soy sauce is to put glutamates into the sauce, increasing the savory (“umami”) flavor, so there are a lot of other things to put in it, You could use stronger beef stock or, my favorite, pure premium anchovy oil (fish sauce). I’ll be making your mom’s version tonight though, minus soy sauce, thank you! I don’t often comment on blogs, but I just had to tell you that I made this tonight and it was divine. My husband said it was one of the best things he’s ever tasted. Thanks to you and your mother for the incredible recipe! I made this dish last night and it was amazing!! I was really surprised there was so much flavour considering it only required a few simple ingredients. I served it with mashed mixed potato & sweet potato and some steamed peas. Delicious and healthy. Thank you for a wonderful recipe. It will be a regular in our house! Thanks for a great recipe Tanya, and nice to see it stays true to its Russian roots. I have been looking for a more traditional version and this one hits all the right spots! I am assuming from the picture at the top you serve this on top of rice which makes me SO happy! That’s how my mom makes it and everywhere/one else I’ve had it has it on noodles. This recipe was absolutely delicious! I am not a fan of beef stroganoff, but my hubby requested it. So, I set out to find a good recipe. Yours was the best I’ve ever tasted! You have made me a fan. Thanks! Tried your recipe tonight – it was fantastic. Instead of beef broth I used Bovril beef extract, which added a lot of flavor. I also used 1/2 cup of sour cream and 1/2 cup of cream. One more point. I was cooking for 2, so only used 1/2 kg of meat, but kept all of the other ingredients the same as I like the dish to be saucy. Turned out perfect! Thank you for the great recipe! We use the same Le Cruset Dutch Oven. I think it has been discontinued unfortunately. Great recipe though. 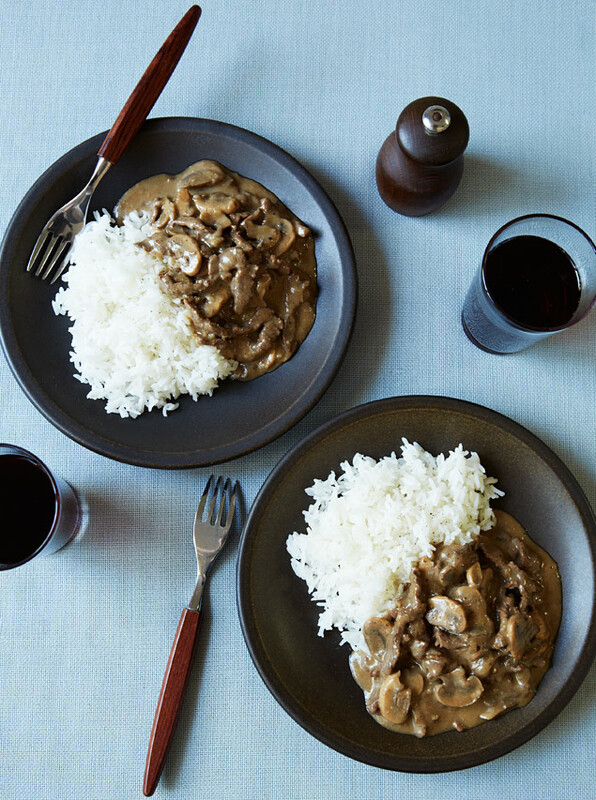 Your recipe sounds amazing, ive been searching for a stroganoff recipe to use in restaurant servce and this one looks pretty good, will let you know how it goes. Hi Tanya, just cooked your beef stroganoff recipe, and it turned out great. I always add sour cream, but will do your cream also. Love how your borsht looks, so another time maybe, on the weekend. My heritage is fairly similar to you, I’m born here, but my parents were born in Harbin, then Tientsin, and then shanghai. They emigrated here in the early 50’s, but all in sydney. My mother passed away here quite young, so some recipes were lost to me, or I didn’t appreciate when younger. Look forward to trying more of your, or your mums recipes and reacquainting with my heritage. Just a small side question, would you happen to know where I might buy the russki style glass teacups in silver holders, either in sydney or online? These represented my early childhood, with my mum drinking her tea with jam. Regards Vicki. It’s always lovely to hear from people with a similar heritage to my own. I am going to be spending the next two weeks with my mother who is going to show me how to make holodets, pascha and kotleti so those will most likely make it onto the blog at some point. Regarding the tea glasses, I have seen sterling silver examples appear on ebay when searching for Russian props to use in photo shoots, though they are generally expensive, around $100 each. Love an authentic recipe and good photographs too, so thanks. I was surprised this recipe needed no wine, and I love mushrooms too so will be sure to add a generous amount when I try your recipe. Hi tanya, I would definitely like your additional russian recipes, especially pascha and kotletki. Another family staple, were my grandmother tatiana’s fish and meat pies. Does your mum have any recipes? You will definitely be my go to for russian recipes. I do have a few older recipe books, but i believe you may have a new take, on these. As mentioned, really enjoyed your beef stroganoff, and added more mushrooms as you suggested. I was recently in New York, and a highlight was dinner at The Russian Tea Rooms, of course I had to have the stroganoff, which was sublime, the beef falling off the bone, not as we normally know it. My distant family, those who migrated to the USA, not Australia, had a very famous restaurant in Hollywood. I have many photos, with all the big stars, but Sunset changed, and the restaurant eventually closed. The waiters dressed, in Cosack shirts, and no doubt the vodka flowed. Thank you also for the reply on the glasses, will check out, and yes I expected them to be pricey. If you would prefer to email me personally with recipes, or on your blog, feel free. Glad i found your site, regards Vicki. Loved this recipe! We added a dash of brandy towards the end, and sprinkled it with chopped coriander leaves. Perfect! Thank you for sharing this delightful recipe! I come back to it again and again, as it works out every time. I so enjoy the rich, warming and delicious treat that evolves. Brava!!! I tried this recipe last night, add a little bit of parmesan at the end of cooking and it was superb!! my husband love it!! Thank you for sharing!! Thanks so much for this recipe. The family loved it. I was dubious about using soy sauce, but it’s perfect. Will definitely be having this again. Yes! I used to eat this as a child and as soon as I saw this recipe I had insane pangs of nostalgia and guess what I’m having for dinner tomorrow night?! Its such an amazing dish. I love both your receipe and your mother’s. I live in Mexico, and there is a large comunity of jewish people from Ruddian descent. I learned from my grandmother and mother in law to love Russian and Polisgh food. Have you published a Russian Receipe Book? I would love to buy one. PS. Is this also called Szarkoie? Couldn’t find a mix so I looked up a recipe for stroganoff. I tried yours a it was great. My go to recipe. Absolutely delicious!! Just made this recipe this evening. It is delicious. Thank you for sharing it. Back to your page again! Time for The Best Stroganoff, today. Thank you so much for sharing the recipe. It is always wonderful, as well as open to “tweaking”- I add a teensy bit of garlic. I felt the need to make comment as this is the fourth time I’ve made this recipe and it is now my “go to” for a family Strog. Everyone loves it especially my husband who considers himself a Stroganoff expert. I normally double the mushrooms and serve it with shell pasta. If it’s a bit liquidy then the pasta soaks up the flavour in the bowl prior to serving. Thank you for sharing Tanya. Thought I would try making Beef Stroganoff for the first time (not sure why it has taken me so long! ), anyway I can’t use sour cream as my Husband is Lactose Intolerant so was looking for something where I could use Liddells Lactose free cream. I came across this blog and though perfect, as I didn’t have any Worcestershire sauce either, so the Soy sauce was a great fit! I cooked mine for a bit longer than the 45 mins, I probably cooked it for about 90 mins but it turned out absolutely beautiful!! The only thing is that it sort of curdled with the lactose free cream, but I think that this was just down to the type of cream used, but it didn’t affect the taste! So thanks for this recipe, I have shared it with 2 other people already!